The Ultimate Amazon FBA Sales Spreadsheet is by far, the most advanced and comprehensive spreadsheet available for Amazon FBA sellers. We’ve made it incredibly versatile, and built features you didn’t think were even possible with a spreadsheet! 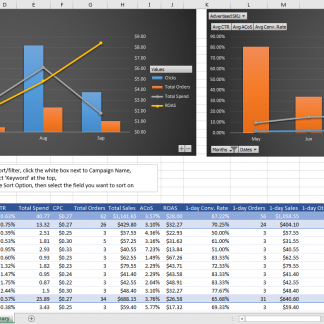 You simply won’t believe that we made a spreadsheet that can filter, display, and summarize your sales data like the Ultimate Amazon FBA Sales Spreadsheet. 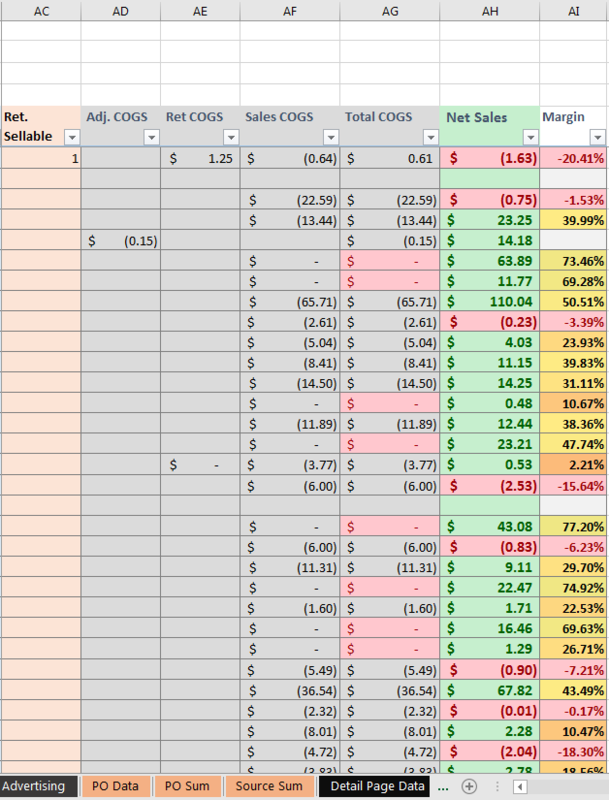 The Ultimate Amazon FBA Sales Spreadsheet even gives you the ability to accurately and dynamically calculate COGS over time. Most online solutions can’t even do this! Best of all, no monthly fees, and no giving your data to a 3rd party! The Dashboard – View all important data in one place! 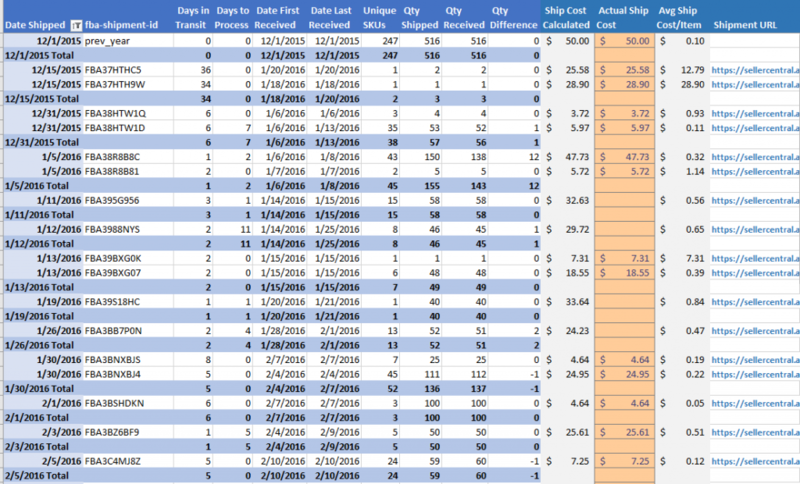 Sales Tracking – 3 Different ways to view sales statistics! The Daily Summary is filterable by any date range, settlement ID, sku or type (Order, Adjustment, Inventory & Service Fees), etc. 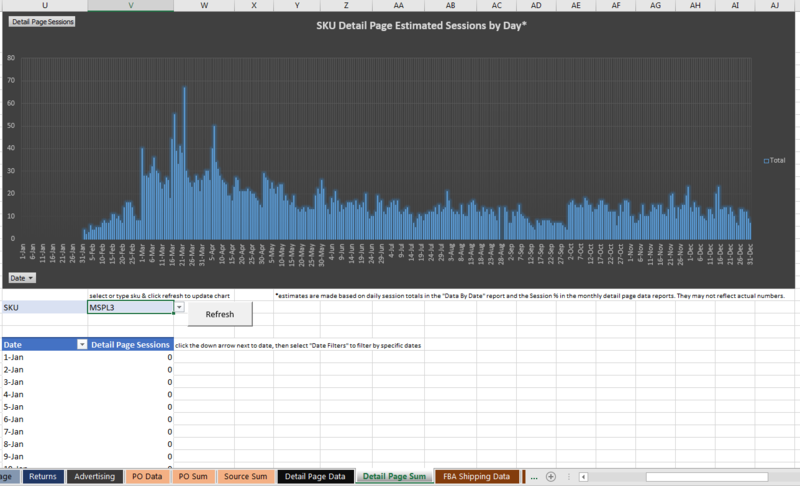 View estimated Detail Page Sessions by DAY, by SKU! Automatic downloading of data reports from Seller Central (for PC only) – just click a button to refresh all of your data! 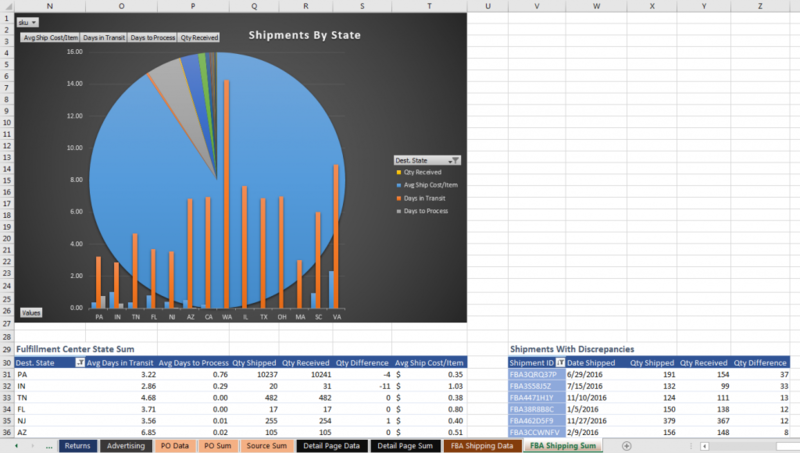 The spreadsheet can handle as much sales data as your computer can – we do recommend a 64 bit Excel, high memory computer for over 100,000 sales a year. The upper limit of Excel is 1 million rows per sheet. Don’t pay $50 or more a MONTH to hand over your sales data to a 3rd party company. Pay once, and keep it on your computer with our easy to use spreadsheet! – Selecting a month in the month drop down or a Settlement ID now filters everything automatically on the Product Sum page. – Fixed crash bugs with Excel For Mac when importing sales data, shipping data, or Update on the dashboard. 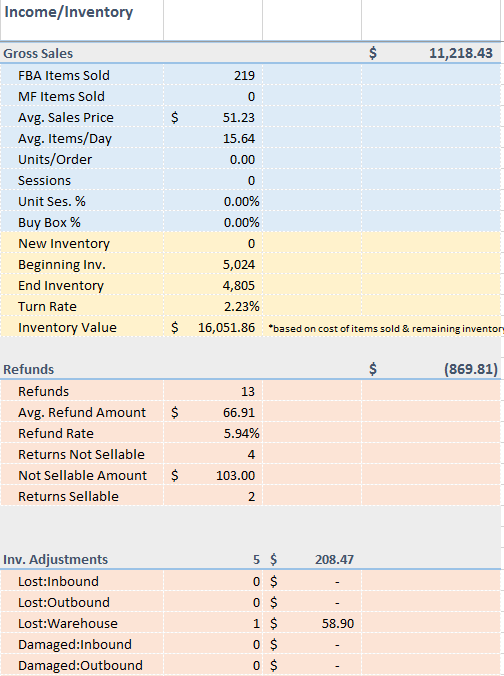 – Improved COGS calculation for items that, when returned, were entered back into inventory, For example, if you sold 1 item, it was returned, but then automatically put back into inventory, COGS would not calculate for the second sale unless you had a quantity of 2 entered for that item on the PO Data sheet. – Fixed bug with return COGS calculation total on Product Sum sheet. Previously only items that had sales during the given period were calculated. – Added "Days in Stock"
– Avg Sales/Day now calculates from "Days in Stock"
– Fixed bug with monthly Tax calculation on Year Summary – previously only orders were being calculated, now return Tax are included. – Added "Manual Processing Fee", and "Long-Term Storage Fees"
– COGS calculation for returns now gets its value from the matching order ID. If there is no matching order ID, COGS are averaged from what is available in the PO Sum sheet. – Added check to auto-importing advertising data to only download reports for data that are not already loaded, and only reports for the current year. Previously all reports were downloaded every time, and all data was reloaded, wasting time. – Added feature to download Returns and Reimbursement reports if they have already been generated for that day, instead of generating them again and downloading. – Changed the way fulfillment reports (returns, reimbursements, received inventory, inventory history) are generated and downloaded for auto-import. Previously they were generated and downloaded one at a time, wasting a LOT of time. Now they are generated at the beginning of the process and then downloaded at the end. – Changed auto-import for sales data to import incrementally by date for the current year instead of all data every time. This will save time significantly on generating the sales report and updating data. – Added check to make sure the last sales report isn\\\'t "Scheduled"
– Improved the way the Auto-Importer actually clicks "save as" in IE, inputs the folder, and file name. The old method was causing issues for some people, and open would be clicked, and/or the file name would not be changed. – Fixed bug with importing Canadian sales data. Fields were not lining up correctly. 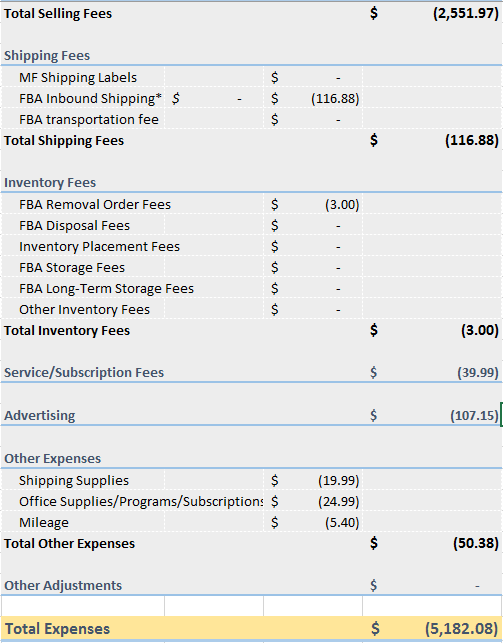 – Improved the way FBA Shipping SKU Lists are downloaded and imported for Auto-Importing. Previously the download link was being clicked – now the download URLs are loaded directly. 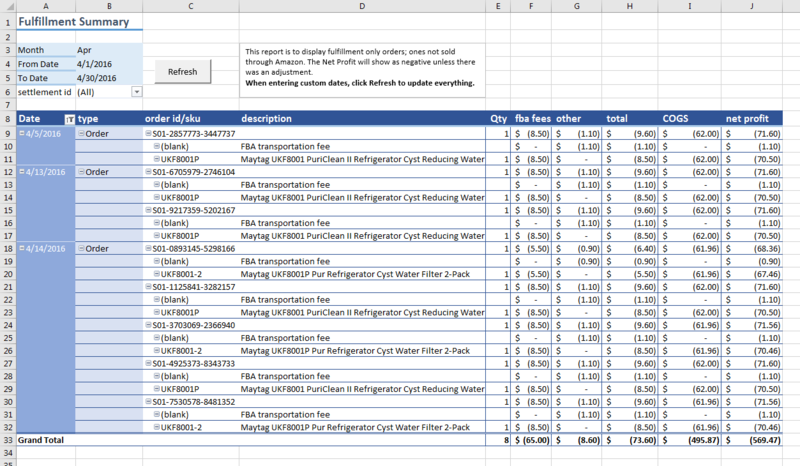 – Added completely new method for importing FBA Shipping SKU Data! It is much faster and you no longer have to download a file for every shipment. This also means it is more reliable! 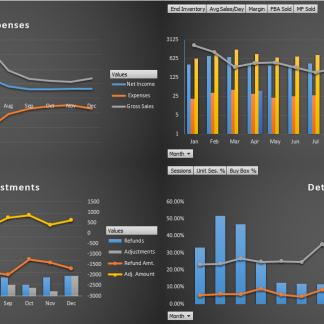 – Added separate and more detailed stats for Income & Expenses sheet. This was previously on the right side of the Product Sum sheet. 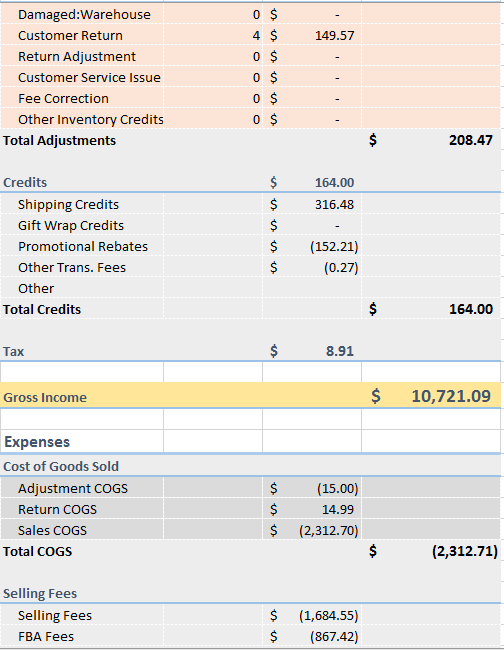 Calculations with refunds and other fees are now in line with Amazon Summary reports, and contain all (plus more) of the fields. – Added ability to sort Product Sum sheet by any field. – Fixed bug that counted MF sold incorrectly when no MF orders were placed. – Added timeout for waiting for IE window to do something. If it doesn\\\'t after 10 seconds, it will close the window and move on or reload a page. I’m in the UK (or other country) looking at my US Data, and it is not filtering by date – how do I fix this? This can happen if the Amazon data is in one format, but your regional settings on your computer, which Excel uses, are in a different format. The dates in the Amazon data need to match the date format on your computer. 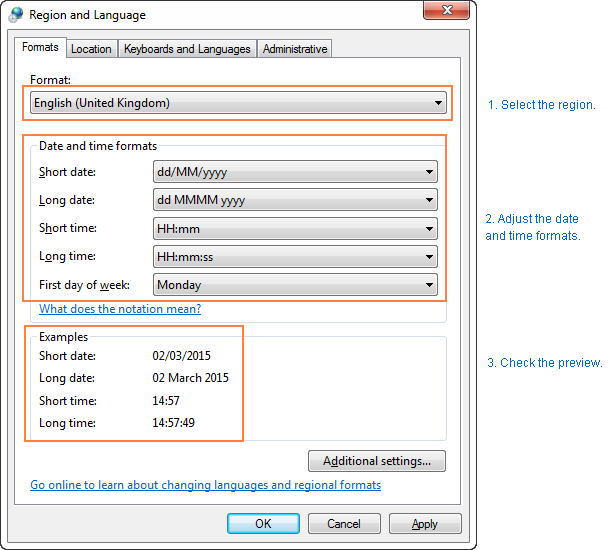 For example, you have US Amazon data, so dates will be converted so Excel can use them to m/d/yyyy, but you are in the UK, so your computer is setup with dates in the format d/m/yyyy. This confuses Excel. On your computer, Go to Control panel and click Region and Language. If in your Control panel opens in Category view, then click Clock, Language, and Region > Region and Language > Change the date, time, or number format. If you are in the UK, loading US Amazon data, choose “English (United States)” at the top, and click Apply. You may need to download a fresh copy of the spreadsheet after applying these settings! Things may have broken on the back end! Dates should now be in the correct format on your spreadsheet. Will the Sales Spreadsheet work with Amazon.ca, Amazon.co.uk, Amazon.de, etc? 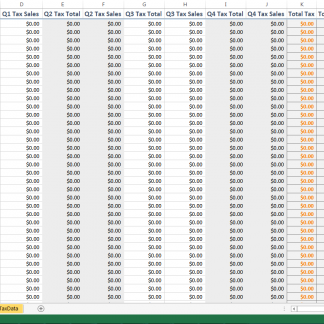 The Ultimate Sales Spreadsheet will work properly on Amazon properties that output their reports in English. If you attempt to use the spreadsheet with non-English reports, it will not calculate Returns, and detailed fees properly because it is looking for specific English phrases in the reports to categorize those fees. You must have separate spreadsheets between properties unless you combine reports before entering them into the spreadsheet. Why are there duplicates on the Prod Summary sheet? 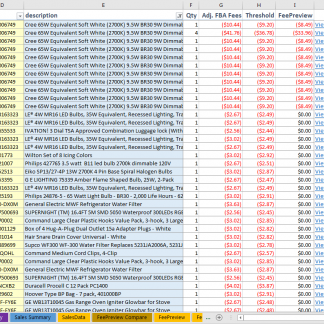 If a difference is found, find it on the PO data sheet and change it to match the SKU is in the sales data. This will happen when the name of the item has changed at some point or multiple times. There may also be adjustments descriptions. 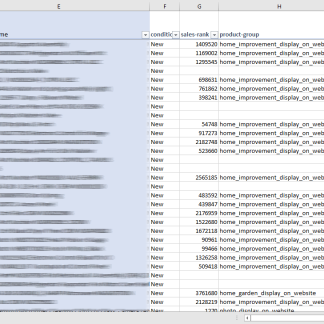 This is normal due to the way we are finding unique names within sales data. What is the number on the far right of the Sales Data sheet? This is a running total. It is the amount of that SKU sold up until that point in time. This field is used to compare to the quantity (on the PO sheets) for the price calculation. What happens when I send a return back to Amazon to be sold? If you receive a return and decide that it is sellable, change column N to “Yes” on the Returns sheet for that item. This will put it back into inventory. If you return it to Amazon under a different SKU, do not change column N – enter that SKU on the corresponding monthly PO sheet. Can manifest data from liquidators like 888 lots be used for PO data? Absolutely! As long as you can copy in the SKU, Quantity, and Cost. Optionally you can enter the shipping cost according to the instructions on the PO Data sheet. 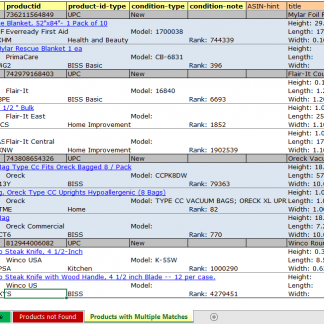 COGS are not populating for a SKU in the Sales Data – what is going on? Make sure there is an entry for that SKU on the PO data sheet. 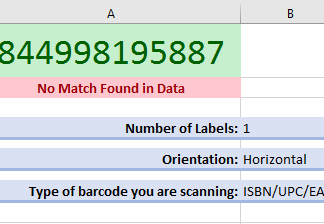 If there is, make sure that the number is entered exactly as it appears in the Sales Data. There could be a leading 0 or a space that you can’t see. 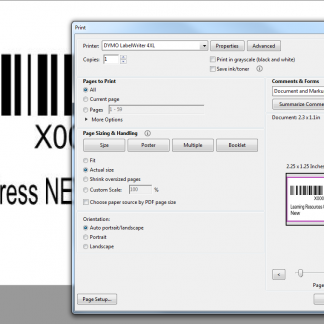 When pasting in SKU’s into the PO data sheet, make sure to choose ‘match destination formatting’. 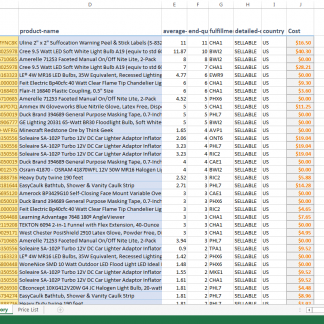 Even if you use only numbers for SKU’s they must remain as text, otherwise Excel will not match them correctly. If you’ve accidentally changed the SKU to format as numbers, right click the SKU, choose format and select text. Starting with v1.9, the proper formatting is automatically applied each time the “Load/Refresh ALL data” button on the Dashboard is pressed. Go to the Dashboard and click “Load/Refresh ALL data” again. Sometimes when new data is added it does not refresh other tables in an order that catches all of the individual changes. 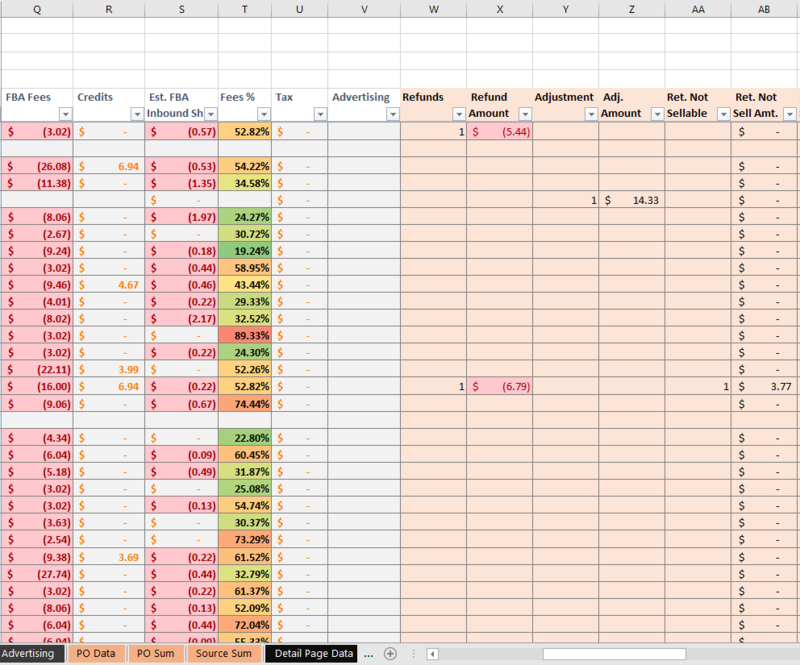 If none of this works, download the latest version of the spreadsheet. We’ve made improvements in the most recent versions that fix various forms of SKUs (for example, spaces) that were causing issues in past versions. How do I enter in PO data? This part will require some manual entry if you do not already have PO data in a similar format. The important thing is that the SKU matches the SKU in the imported Amazon data. 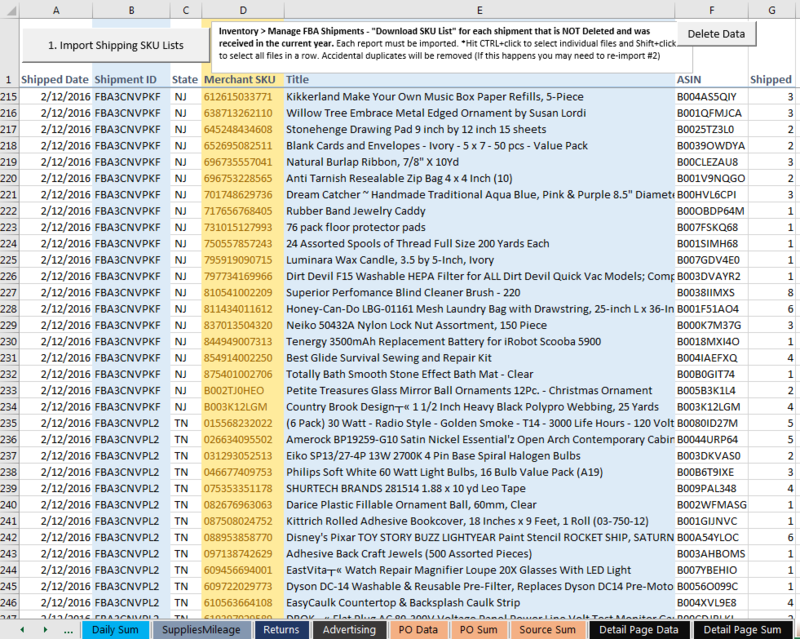 An easy way to get a list of SKU and Title, the monthly Sum (Summary) sheets contain product lists for that month. 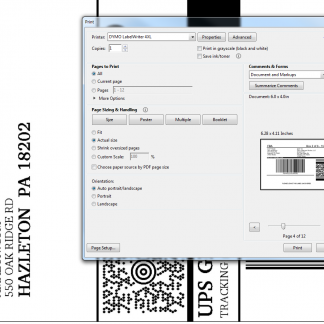 It can simply be copied into the PO sheet, and the cost price and quantity can be added. If you are having trouble with COGS data populating see this entry. How many times can the price change for a single SKU? The spreadsheet will handle 13 different prices per SKU – one for the previous year inventory and one for each month. If a SKU is purchased for different prices in a single month, the average of those prices will be used. If you want a more exact COGS for that SKU, change the date for that PO entry to a month that you did not purchase that item, or to a month with the same price. Just don’t forget that this will affect your PO purchase data for that month. Does the spreadsheet update Amazon data automatically? You have to press a button to do so, YES! 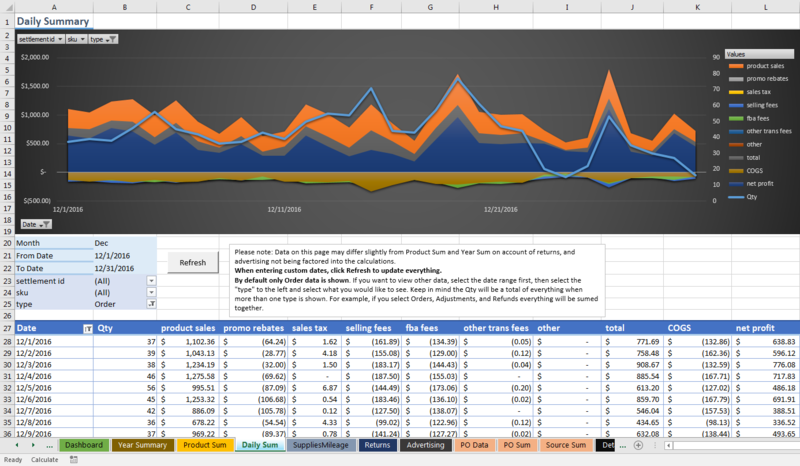 In v2.1 we introduced a feature that automatically downloads the reports that the spreadsheet needs. Depending on the amount of data you have, this can take some time to complete. 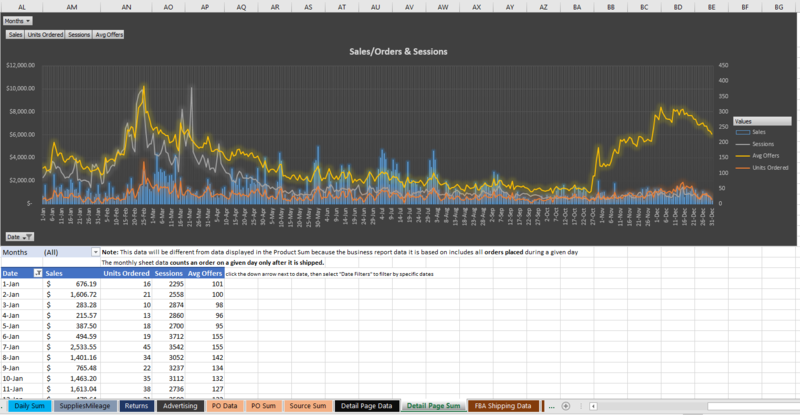 Sales, Returns, Reimbursements, Detail Page data, Advertising, and FBA Shipping Data is downloaded with this feature. When you need to update data, it only requests the days between when you last updated data and yesterday’s date. Sorry, this feature does not work with Excel for Mac because it uses automation features only available with MS Internet Explorer. 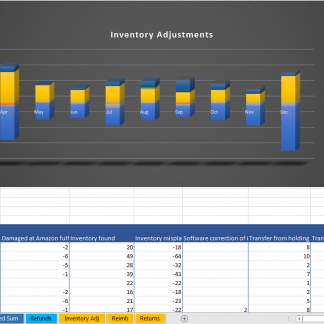 In order for the spreadsheet to update your data, you must download the sales reports from Amazon, then import them into the spreadsheet. This is done with a few simple clicks. Optionally, you can load other reports like Returns, Reimbursements, Detail Page data, Advertising, and FBA Shipping Data to view more statistics. 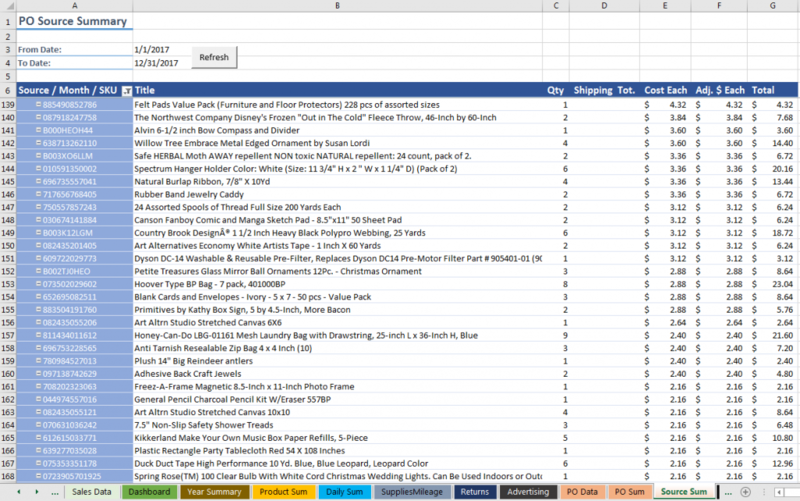 Can I use the Ultimate FBA Sales Spreadsheet with Google Sheets? Sorry, no. The spreadsheet uses very complex formulas, macros, and pivot tables that Google Sheets does not support.